Propaganda was central to National Socialist Germany. This page is a collection of English translations of Nazi propaganda for the period 1933-1945, part of a larger site on German propaganda. The goal is to help people understand the great totalitarian systems of the twentieth century by giving them access to primary material. The archive is substantial. If you are looking for something specific, try the search function. For further information on the German Propaganda Archive, see the FAQ. My book Bending Spines: The Propagandas of Nazi Germany and the German Democratic Republic (Michigan State University Press, 2004) provides an analysis of much of the material on the German Propaganda Archive. The hardcover edition is out of print, but the paperback edition remains available. 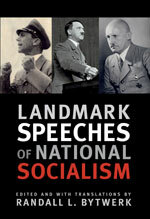 My most recent book is Landmark Speeches of National Socialism (Texas A&M University Press). It is available in hardcover and paperback editions. Joseph Goebbels: A collection of over 100 speeches and essays. Hans Frank: His 1934 Nuremberg Rally speech on Nazi law. Hermann Göring: A speech on 9 April 1933. A 30 January 1937 speech on foreign policy. Proclamation of 22 June 1941: Hitler justifies invading Russia. “To the Old Guard in Munich” (1941): Available in Landmark Speeches of National Socialism. Hitlerâ€™s last speech (1945): Available in Landmark Speeches of National Socialism. â€œThe Oath to Hitlerâ€�: A million Nazis take an oath to Hitler. â€œTo the Front Fighters of the Worldâ€�: Germany wants peace (1934). The referendum on Hitler: Hitler takes total power. “Fate  I believe”: A 1937 speech preaching a pseudo-religious faith. “The Jews or Us...”: A bad 1937 speech on aspects of Nazism. International Ethnic Mush or United National States of Europe? (1941). Pestilential Miasma of the World: (1944). “To Be German is to Be Strong”: A January 1936 speech. The Woman in National Socialism (1936): Available in Landmark Speeches of National Socialism. Speech at the 1936 Nuremberg Rally. Speech at the 1938 Nuremberg Rally. Speech on Kristallnacht (1938): Available in Landmark Speeches of National Socialism. Just before World War II begins: 4 July 1939. Speeches and articles by Nazi Gauleiter: This page is in its early stages. Material from Julius Streicher’s Stürmer-Verlag. Solving the “Jewish Question”: Two April 1933 articles by Nazi leaders. Neues Volk: Material from the partyâ€™s racial policy office (1934-1941). A German Catechism: 1934 anti-Semitic material for the schools. “Why the Aryan Law”: A 1934 Nazi pamphlet on racial laws. Advice for Nazi speakers on anti-Semitic propaganda: What to say in Fall 1935. Ten Anti-Semitic Arguments: Advice to propagandists in 1936. Zionism: Zionism as part of the Jewish conspiracy (1936). “The Eternal Jew”: Photographs from a 1937 Nazi anti-Semitic book. Hitler Youth Material: What HJ leaders said about race in 1937. Genetics and Racial Science for teachers (1937). Protocols of the Elders of Zion: A 1938 Nazi introduction to the forgery. “The ‘Decent’ Jew”: A 1939 essay denouncing the Jews. “The Panic Party”: A 1939 satirical article on Jewish emigration. The Jewish World Plague: A chapter from Hermann Esserâ€™s 1939 book. Albert Einstein: The Nazis didn’t like him, since he was a Jew (1939). Ahasver: A section from a book on the fall of France. The Jewish Problem: From a citizenâ€™s handbook to the Third Reich. Jud Süß: An ad for the 1940 anti-Semitic film. Jud Süß: The program for an anti-Semitic film (1940). A review of the film The Eternal Jew (1940). People and Race: Material from a Nazi racial monthly. “When you see this symbol...”: A 1941 anti-Semitic flyer. “The Jews in World Politics”: Part of a 1942 pamphlet on the Jews. Questions and answers on racial matters: Dealing with hard cases (1942). Racial Policy: Parts of a 1943 SS booklet on racial theory. The Jewish World Parasite: A pamphlet from 1943. Anti-Semitism for girls: Training material from February 1944. Pestilential Miasma of the World: A 1944 book by Robert Ley. 1944 discussion material: A call to annihilate the Jews. “National Socialist Racial Policy”: A 1934 speech on racial doctrine. Race: A 1934 radio talk to the youth. Blood is Holy: 1935 radio talk to the youth. German Propaganda: An Archive of Antisemitic publications from 1930-1945: A related site that includes PDFs of much original material. Weekly quotation posters: Nazi posters with inspiring quotations. The texts of many weekly quotation posters: Often with an image (1937-1944). Hitler Youth quotation posters: Nine examples from 1940. Color illustrations from 1933: From a bestselling “coffee table” book. The National Revolution: Pictures from 1933 on Hitlerâ€™s takeover. Nazi postcards: A small collection of propaganda postcards. Nazi uniforms: Clothing as propaganda. Nazi regalia: Flags, banners, badges. 2000 Years of German Culture: Pictures from a 1937 event. Nazi decorative items: Pages from a 1939 catalog. Gallery of Gauleiter: Propaganda photos of Nazi leaders. Propaganda in postage stamps: A small collection of Nazi-era stamps. Racial wall charts: For use in schools. Bildbericht der Woche: A March 1939 edition of a weekly slide strip. Nazi architecture: Photographs of Nazi buildings in Munich. Miscellaneous Images: Vivid images that did not fit elsewhere. City Maps from 1938: Propaganda in names. German city scenes: Photographs from 1940. Tran und Helle: A comedy skit on POWs and the black market (1940?). Eight small propaganda flyers from the war years. Ich kämpfe: Parts of a book given to new party members in 1943. A Nazi Advent: From a 1943 Advent calendar. A Nazi Christmas: From a book of material for Christmas 1944. Winterhilfswerk booklets: For those who donated to the Nazi charity. Der Führer 1933: Hitlerâ€™s accomplishments of that year. The Führer Makes History 1938. The Führer in the Mountains. The Führerâ€™s Battle in the East: The first two weeks in Poland. Gerhard Koeppen: One of a series on Knightâ€™s Cross recipients. Nazi art on 9 November: The “holiest” day on the Nazi calendar. Hitler portraits: Nazi art portraying Hitler. Nazi war art: Examples from 1940-1944. Stukas Attack: A 1940 Nazi childrenâ€™s game. Do You Know That? ; A 1940 parlor game on German history. Regaining German colonies in Africa: Optimism in 1941. German Foreign Office Press Releases: Three examples from 1941. Signal: A propaganda magazine circulated in 25 languages. Europe at Work in Germany: A 1943 book on foreign workers. Leaflets from D-Day: Nazi leaflets aimed at American soldiers. German wartime advertising: Examples from 1944. A Nazi Motherâ€™s Day card: 1944. The role of the Nazi Party in civil defense: Building party credibility in 1944. Victory or death: The text of a propaganda leaflet (1945). “War Library of the German Youth”: Pamphlets issued 1940-1942. Altmark — Baralong: A 1940 anti-British pamphlet. A German Primer: A popular 1940 booklet on Nazi military virtues. How They Lie: A 1940 pamphlet accuses the Allies of inventing German atrocities. “Warning! Enemy Propaganda!”: 1940 advice on enemy propaganda. International Ethnic Mush or United National States of Europe? : Robert Ley in 1941. The War Goal of World Plutocracy: A remarkable pamphlet (1941). Nazi soldiers’ letters from Russia: Excerpts from letters. Not Empty Phrases, but Rather Clarity:A 1942 pamphlet on Nazi ideology. The Attack on Cologne: A 1942 pamphlet on British bombing. What Does Bolshevization Mean in Reality? : A spring 1943 pamphlet. Facts Speak for Victory: June 1943 speeches by Speer and Goebbels. The Secret of Japanâ€™s Strength: A1943 Nazi booklet on Japan. Never! : A late -1944 pamphlet urging Gemans to fight or die. The outbreak of WWII: From the Wehrmachtâ€™s biweekly. “German Torpedoes in Scapa Flow”: Talks by Hans Fritzsche (1939). Three war articles from summer 1940: Confident and boastful. The fall of France: Material distributed in the United States in 1940. “Churchill Orders Destruction”: A 1940 article on British bombing. The Campaign in the East is Over!â€�: Premature claims of victory over the USSR in October 1941. First Reaction to the Japanese Attack on Pearl Harbor (9 December 1941). “That is Heroism!”: A soldier destroys Soviet tanks (1943). Press Coverage of Stalingrad: Articles before and after the loss (1941-1943). Pictures from January 1943: A satirical commentary on the war. The Battle of Monte Cassino: Explaining a lost battle in May 1944. Rome: Putting the best face on the loss of Rome in June 1944. Nazis vs. Superman: A 1940 article attacking Superman. “False Consideration”: A 1943 article urging harsh treatment of complainers. “He is Victory!”: A 1944 article on Hitlerâ€™s birthday. â€œWhy London is Burningâ€�: German gloating after nine days of bombing (September 1940). â€œThe Delayed Invasionâ€�: On why England has yet to be invaded (September 1940). “The Uncertain Casualty List”: On the missing at Stalingrad (February 1943). “The Invasion”: On the prospects of an Allied landing (January 1944). “Unexpected Consequences”: On the impact of Allied bombing. “First Results of the V-1”: The first V-1s were launched just after D-Day. “The Kitschified Mass Soul”: A 1944 discussion of American advertising. “Reality is Different”: On the morale of American soldiers (December 1944). “Berlin, a Giant Hedgehog”: Preparations for the final battle (March 1945). See also Goebbelsâ€™s editorials from Das Reich. “Concentration Camp”: German kids at play (April 1933). On Nazi radio: A 1934 chapter by Eugen Hadamovsky. The 1936 Nuremberg Rally: Translations from the official proceedings. The 1936 Gau Südhannover-Braunschweig rally: Nuremberg in miniature. The 1936 Nazi farmers rally: Agriculture for the Nazi cause. “Last Words”: A collection of dying words of Nazis from a 1936 article. Nazi Economic Achievements: A brochure from 1936. The Great Anti-Bolshevist Exhibition: The program from the 1937 event. “With German Soldiers in Liberated Austria”: The takeover of Austria in 1938. The Volkswagen: A model car to be built in a model city (1938). “Hail All-Germany!” Austrian fans of traditional costumes welcome Hitler (1938). “Memel is Free”: From a 1939 book on Hitlerâ€™s territorial gains. “The Victory of Faith”: A 1939 article on worldviews. Berlin Television Schedule: What to watch in March 1939. The German house: Nazi views on how to build a house (1937). Nazi interior decoration: How should a Nazi home look inside (1939). Diary of an S. A. Leader: A 1939 propaganda book on the Storm Troopers. “The Soviet Paradise”: A 1942 exhibition on the Soviet Union. Nazi Economics: Party economic propaganda from 1938-1940. Germany and You: A Nazi magazine for English-speaking readers (1942). Recollections of an early Nazi speaker: Taken from a book by Hans Hinkel. The Battle of the Pharus Hall: Goebbels describes a 1927 battle in Berlin. A meeting hall battle in Hamburg in 1930: Violence glorified. Comrade! Keep Moving: Nazi history in Bavaria, 1925-1930. How We Fought! : Nazi history in Frankfurt (M). Battle and Victory: Exceprts from a history of Gau Westfalen-SÃ¼d (1938). The January 1933 election in Lippe: Two weeks before Hitlerâ€™s takeover. “Humorous” Nazi stories of the Kampfzeit: An effort at Nazi humor. Early Nazi speaking experiences: Stories by Walter Tießler. The Hitler Youth in Kiel: Its history from 1930-1933, published in 1938. The Hitler No One Knows: First published in 1932, often reprinted. Caricatures of Hitler: Taken from an unusual 1933 German book. Hitlerâ€™s Paintings: Twelve examples from 1908-1918. “The Life of the Führer”: A chapter from the Nazi handbook for boys. “We Owe It to the Führer”: A 1938 pamphlet on Hitlerâ€™s deeds. The Song of the Faithful: Poems in praise of Adolf Hitler from 1938. Hitler on magazine covers: Illustrierter Beobachter 1938-1939. Hitlerâ€™s 50th birthday: Photographs from 1939. Everybodyâ€™s Hitler: A 1940 booklet for conquered Alsace. That is Victory! : Letters in praise of Hitler from 1940. Hitlerâ€™s Obituary: From a 2 May 1945 German newspaper. See also speeches on Hitlerâ€™s birthday in the Goebbels section. The Illustrierter Beobachter 1934-1943: The Nazi illustrated weekly. The Frauen Warte: Issues of the Nazi womenâ€™s magazine (1934-1945). Der Pimpf: Material from the Nazi magazine for boys, 1935-1944. Das deutsche Mädel: The Nazi magazine for girls (1936-1943). Der Schulungsbrief: 1942-44 material on political education. “Education in National Socialist Germany”: On Nazi education. The Battle for Germany: A 1938 schoolbook on the Nazi Party. You and Your People: Nazi ideology for 14-year-olds (1940). Parts of a pre-war reading text: Propaganda for the very young. Parts of a 1936 reading text: More propaganda for the young. Parts of a 1941 reading text. More for the very young. A chapter from a 1943 geography text: Germany needed more land. Excerpts from The Land without a Heart, a 1942 book on the U.S.
“America as a Perversion of European Culture”: A 1942 pamphlet. “Europe and America”: A 1942 analysis of Americaâ€™s racial makeup. Roosevelt Betrays America: A 1942 pamphlet by Robert Ley. â€œAmericanization Would Mean the End of Europeâ€�: Late-1944 material. Inside England: Parts of a book about England. Robber England: Material from a 1941 illustrated book on England. Guernsey Evening Press: A 1942 issue from Nazi-occupied Guernsey. VI. Material from Nazi Literature for Propagandists. Propaganda and National Power: Eugen Hadamovskyâ€™s 1933 book on propaganda. Hitler Youth training material: What leaders were to teach kids (1935-1944). The Political Poster: A 1938 book on effective posters. “The Political Work of the Radio Announcer”: A 1939 essay on radio. Banned music: A list of what to avoid from 1939. Propagandizing women: Instructions from the Nazi women’s group (August 1941). Anti-Bolshevist propaganda: Guidelines after Stalingrad (February 1943). On relations with foreigners: Interesting 1943 advice to party leaders. “The Officer and Enemy Propaganda”: For officers training recruits. Late war advice to propagandists in Gau Sachsen: November 1944-April 1945. The Werewolf Movement: A call for building resistance (April 1945). Unser Wille und Weg: 34 articles from the monthly for propagandists. The propaganda campaign for winter 1937/38. Worldview training for girls: Hitler Youth material (1938). Gau Propaganda in Westfalen-Nord: Organizing propaganda in 1940. A Propaganda Primer: A 1942 handbook on propaganda. The propaganda system: What propagandists needed to know (1942). Propaganda plan for winter 1941/42: The problem of Russia. Propaganda plan for spring 1942: Marching orders for propagandists. Advice for county (Kreis) propaganda leaders (March 1943). A propaganda business meeting: Motivating propagandists in 1943. A propaganda campaign against spies: Be quiet! (1944). Advice on discussion meetings: Training party members in 1944. Why victory is sure: Training material from mid-1944. Speaker Express Information: 50 editions from 1941-1944. The battle against the Jews: A summary of anti-Semitic arguments (Fall 1935). Fighting “Political Catholicism”: Arguments from August 1935. Information on the U.S. (April 1939). Information on Englandâ€™s war guilt: (November 1939). Rudolf Hess and the war situation: Advice from May 1941. Leave the church: A 1941 memo ordering speakers to quit the church. Submarine warfare: A bright spot after Stalingrad (Feb.-March 1943). The Eternal Battle for Truth: Anti-Semitic material from March 1944. Advice on Bolshevism: Speaker material from June 1944. Model speeches on motherhood, Allied bombing, and the duties of youth (1944-1945): Available in Landmark Speeches of National Socialism. A 1939 bibliography for Nazi propagandists. September 1941: Preparing for a hard winter. October 1941 - January 1942: Guidelines on the invasion of the Soviet Union. October 1941: Placing German victory in historical context. September 1942: Victory at Stalingrad expected. February 1943: Just after the defeat at Stalingrad. May 1943: The anti-Semitic special edition. June 1944: Just after D-Day. August 1944: On anti-Semitic strategies. Using Christian holidays: Absorbing old holidays into Nazi culture (1937). Celebrating Christmas Nazi style (1939). Ceremonies for the youth: Nazi rites of passage from 1939. On party rituals: The introduction to a 1941 book for party officials. Nazi gravestones: How to bury a Nazi. Hitlerâ€™s Birthday 1942: A model speech and other material. 9 November 1942: The holiest day on the Nazi calendar. 30 January 1943: Plans for Nazismâ€™s 10th anniversary. Pictures of â€œgoodâ€� and â€œbadâ€� stage decorations for Nazi ceremonies. Easter 1944: A suggested speech for party observances. Nazi commemoration of the war dead: A sample speech from 1944. Sample Christmas speech for wounded soldiers: What to say in December 1944. A bibliography of material on Nazi propaganda (United States Holocaust Memorial Museum). The GPA Blog: Brief notes on additions to the site (begun March 2008). False Nazi Quotations: Things never said, but widely quoted. My unpublished essay on Nazi visual anti-Semitic rhetoric. FDR and Hitler: My talk on their rhetorical duel in the late 1930s, on CSPAN. Publications by Randall Bytwerk (Mostly related to German propaganda). .
Visitor’s Guide to German Archives and Libraries: Places I’ve visited. German Newsreel Archive: In German, but a great source of newsreels. Digitized books and periodicals: Lots of material is available on-line. German Propaganda Book Shop: Original books from the Nazi era for sale.